After the Enz split (see what I just did there? ), Neil formed Crowded House… and most music fans know what happened next. Crowded House became one of the most globally beloved Pop bands of the late ‘80s and early ‘90s, with Neil’s songwriting being compared to legends like Paul McCartney. With hits like “Don’t Dream Its Over” and “Weather With You,” Crowded House was a critic’s dream band and released four commercially successful albums before splitting in the mid-‘90s. Neil released a few beloved solo albums and worked on various projects before bringing Crowded House back to life in 2007. While taking breaks between CH albums, Neil also worked with his sons Liam and Elroy, his wife Sharon and his brother Tim. His releases with 7 Worlds Collide and Paul Kelly also managed to keep Neil busy during his down time. Needless to say, Neil Finn has remained one of the most prolific and respected singer/songwriters for four decades and counting. 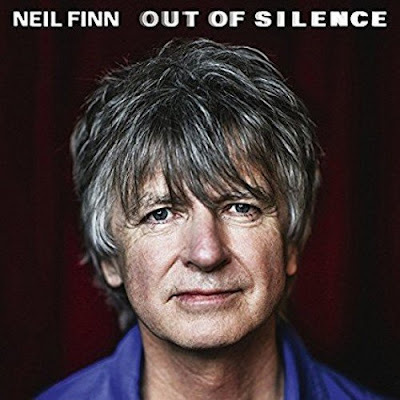 I’m not going to mince words about this release at all and I will be brutally honest: OUT OF SILENCE is the best solo album of his career and certainly one of the best albums he’s ever been involved with (and yes, that includes Crowded House and Split Enz). Delicate and melancholic, OUT OF SILENCE is brutally honest and stunningly beautiful. With Neil sitting at the piano armed with a batch of stunning compositions, he recorded the album live in the studio surrounded by a backing vocal group and a 12-piece string section. Streaming the recording sessions live over the internet, fans were able to witness pure magic being created. And yes, OUT OF SILENCE is a magical experience. Though the lyrics may dip their toes into dark territories (the world is far from perfect), Finn’s melodies are reassuring, calming and ultimately hopeful. “Love Is Emotional” sets the tone of the album but doesn’t necessarily define it. There are moments of sheer beauty that will reach down and touch every listener on an emotional level. However, that level will be unique to each listener. That is the power of music. And magic. With this album, the McCartney comparisons are most certainly apropot. OUT OF SILENCE will probably be called a career-defining album for Finn but one must realize that it is actually just one of at least a dozen career defining albums in his canon. And I’m sure that there will be more to come. Read my review of the Crowded House deluxe editions HERE.